Academic research, artistic practice, and civic engagement are becoming ever more closely linked. Through her ongoing ‘Cultural Agents’ project, Doris Sommer argues for the productive proximity of creative practice and critical thinking, positing them as essential tools for the achievement of social engagement and transformation. This approach challenges the conventional boundaries of disciplinary practice, and more daringly, demands that researchers invent new modalities of practice, strategies of communication, and maps for dissemination. It acknowledges the possibility of failure, but equally intimates the allure of unanticipated success. The risk, as Sommer concludes, invites us to ‘press play’. 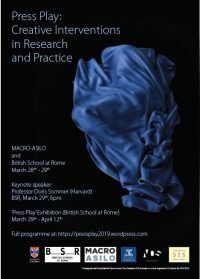 Sommer herself was the keynote speaker at the recent experimental two-day conference ‘Press Play: Creative Interventions in Research and Practice’, held at the British School at Rome and MACRO-ASILO gallery on 28th-29th March 2019. 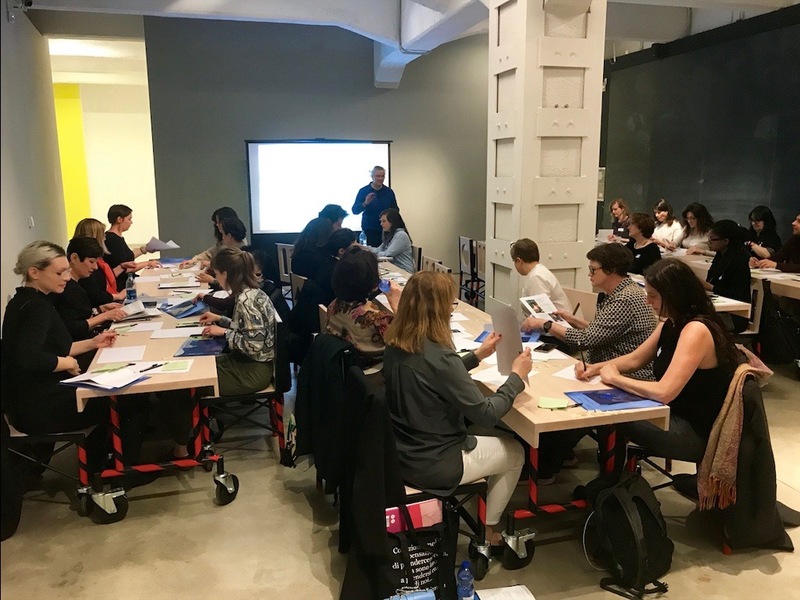 The organizers, Emma Bond and Derek Duncan (University of St Andrews) asked participants to frame their interventions within four interconnected areas (working archives; transcultural movements; quotidian translation; sensory practices). Traditional conference papers were discouraged in favour of critical thinking labs, immersive demonstrations, and practical workshops. An integral part of the conference was the presence throughout of five international artists in residence (Malcolm Angelucci & Chris Caines, Katia Kameli, Nikolaj Bendix Skyum Larsen, and Justin Randolph Thompson), who had prepared new work to be shown in an accompanying exhibition held at the British School at Rome between 29th March and 12th April. Kameli, Larsen and Thompson also spoke about their work in a series of conversations held throughout the conference, and Thompson gave a rousing vocal performance at the opening evening. Three other critical contributions introduced notions of resistance, disruption and challenge as positive markers of change through civic engagement. Caroline Smith, author of The Immigration Handbook, was in conversation with her Italian translator Paola Splendore, and explored the obstacles and losses involved in both translation and the asylum process itself. Phil Davis and Alicia Kent used drumming to ‘disrupt’ the conference format, made narratives out of pieces of string and played word association games with tin foil to show how disruption can offer resistance to the limitations of mechanical learning in classrooms. Ali Alasan, Abimbola Odugbesan and Jacopo Colombini presented the self-organised refugee group ‘Lampedusa in Hamburg’, offering alternative ways to talk about migration. The need to reposition migrants as knowledge-makers was highlighted, thereby challenging Eurocentric assumptions around victimhood, marginalization, knowledge and agency. Artist participants Catrin Webster, Luci Callipari-Marcuzzo and Kim Donaldson engaged fellow presenters in activities such as drawing, crochet and colouring in; the results of which were displayed alongside the work of the exhibiting artists. Other practising artists (Kinga Araya, Phoebe Boswell, Genevieve Guetemme, Dan Popa, Liz Rideal, Mary Sherman and Katie Zazenski) presented their work through an exploration of their modes and methods of critical research. On the 30th participants had the chance to undertake a walking tour with Araya and a guided tour of the MAAM, where Angelucci gave an impromptu presentation of his work on display there. The organizers are grateful to all the presenters and participants, members of the steering committee (Malcolm Angelucci, Catherine Boyle, Shelleen Greene and Siobhán Shilton), postgraduate assistant Ellie Crabtree, curator Silvia Litardi, and our generous funders.